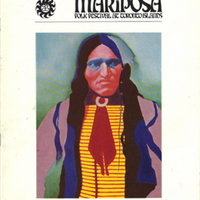 Item consists of the 98 page Mariposa Folk Festival Program for 1971, which was held at the Toronto Islands, Toronto, Ontario from 9-11 July, 1971. 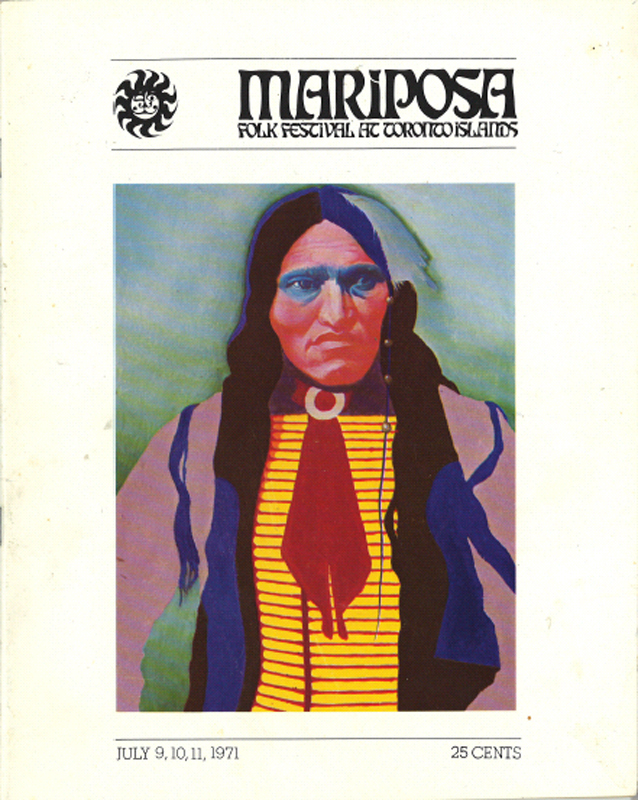 Featuring the work "Painting of Kicking Bear" by Michael Soles on the cover, and an illustration and inscription from the work "Mountain Wolf Woman, The Autobiography of a Winnebago Indian" on the back cover, the festival program was published by Herbert Wise of Music Sales Corporation, edited by Peter Greenwood, with art direction by Ulrich Boege, advertising by Mel Weinberger and staff photography by Elaine Lipson. The program features an illustrated festival schedule of performances and workshops, an alphabetical listing of festival performers and artisans and collages and illustrations by Uli Boege. The 1971 program also features nine feature articles, including "Helo The World, An Autobiography" by David Gahr, "Yurts" by William Coperthwaite, "Macrobiotics" by Carole Getzoff, "Integral Yoga" by Aikya, "Brownie McGhee" by Brownie McGhee and Happy Traum, "Blues" by Peter Greenwood, "The Art of The Luthier" by Michael Gurian, "About 2000 Words" by Tony Glover and "The Guitar Owner's Bible" by Matt Umanov. “Mariposa Folk Festival At Toronto Islands July 9, 10, 11, 1971,” York University Libraries | Clara Thomas Archives & Special Collections online exhibits, accessed April 23, 2019, http://archives.library.yorku.ca/items/show/1609.